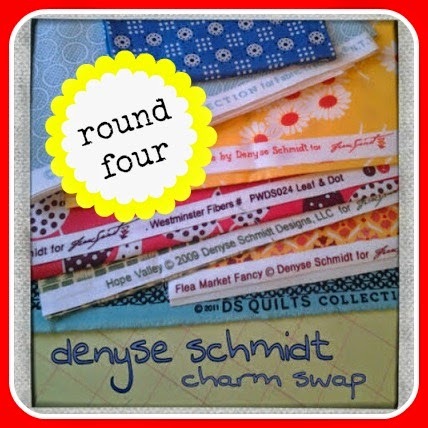 It's time for the next round of the Denyse Schmidt charm swap! I am hosting this time, and can't wait for all that happy fabric mail. If you've never joined in on one of our swaps, now is the time! Head over to the flickr group to grab a spot. The swap is open for 56 spots, but you can sign up for more than one, if you'd like. Each spot requires you to choose 1 yard each of two DS fabrics, cut them into 5" charms (56 from each fabric), and mail them to me. I will then sort them all out, and you will receive 112 different charms in return. Make sense? If you are ordering fabric online, you are welcome to have it shipped direct to me and I will cut them for you. It would save you some shipping costs. We do not allow duplicates within each round, so be sure to post a photo of your fabrics in the group pool so no one else buys it. Fabrics from both her FreeSpirit lines and her DS Quilts for JoAnn's are fine for this swap. The deadline to mail charms to me is November 14th. Hope you'll join us in trading charms!